Halloween 2015 Costume Contest Winners | Take Back Halloween! They’re here! The winners of our 2015 Costume Contest! Our contest was huge this year, and we were astounded by not only the number of entries but the quality and variety. They’re all in our Facebook album, which I invite you to marvel over: 2015 Costume Contest Album. And if you need a refresher on the whole deal, check out our original contest announcement post. I said last year that the judging was agonizing; this year it was excruciating. There were some very, very close decisions, and some of these prizes were awarded on the basis of literally one or two points. If you didn’t win, it doesn’t mean you didn’t do a great job! We just had so many fabulous entries for each category. Also, our contest has grown enough that I think next year we’ll establish separate divisions for professionals, amateurs, and so forth. That way people can compete at their own level. And now, without further ado, here are the winners. Each winner’s photo card from below has also been uploaded to our 2015 Costume Contest Winners album on Facebook so you can share them individually. These are the prize categories that were announced before the contest. They’re based on our own costume categories here on the website: glamour grrls, goddesses and mythological figures, queens, and notable historical women. Winner: Autumn Thomas-Brown as Josephine Baker. Doesn’t she look gorgeous? This is what our Glamour Grrl category is all about: dressing to the nines and piling on the bling for a fabulous night out. 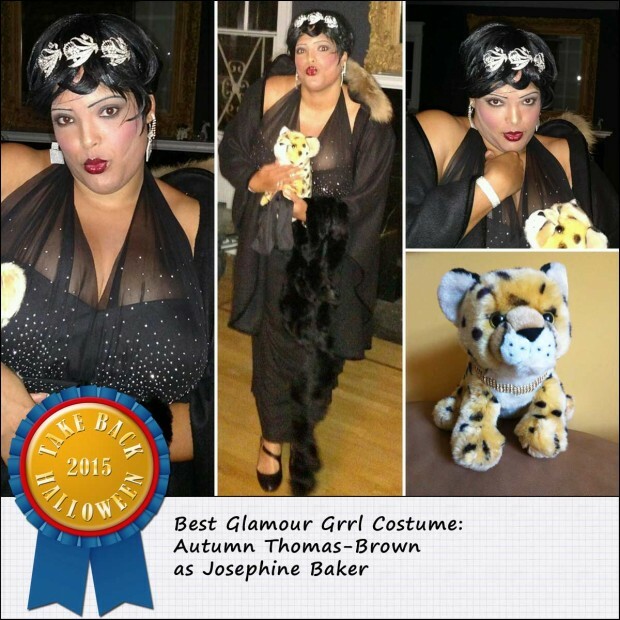 We love that Autumn brought along a little Chiquita (Josephine’s pet cheetah), replete with diamond collar—just as we suggest on our Josephine Baker costume page. Winner: Rae Bradbury-Enslin as Athena Parthenos. 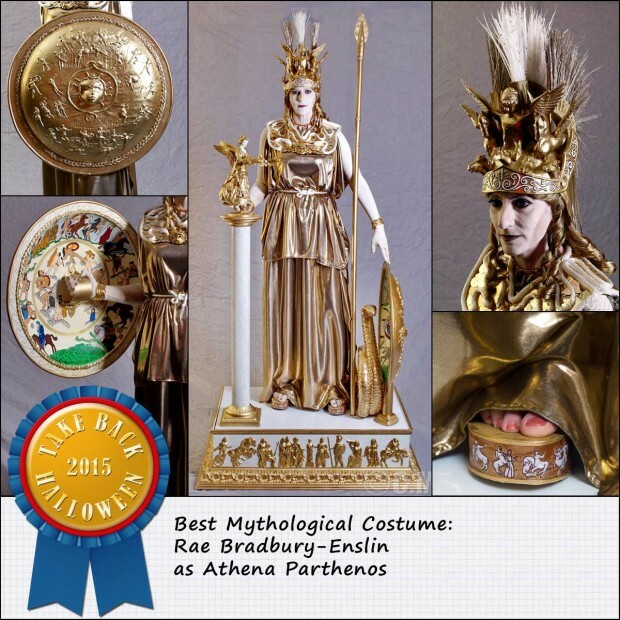 The Athena Parthenos was the huge ivory and gold statue of Athena that once stood in the Parthenon, and Rae’s masterpiece is a recreation of that statue. We use the word “masterpiece” advisedly, because this costume is one of the most astonishing things we’ve ever seen. We’re awarding Best Mythological Costume here, but as we told Rae, really she deserves all the awards the costume world can possibly bestow on her. Winner: Solenn Féral as Christine de Pizan. This whole costume was handmade, and Solenn tells us that she constructed the attor de gibet (the two-horned headpiece) from thick paper, fabric, and “many pins and staples.” We believe it! 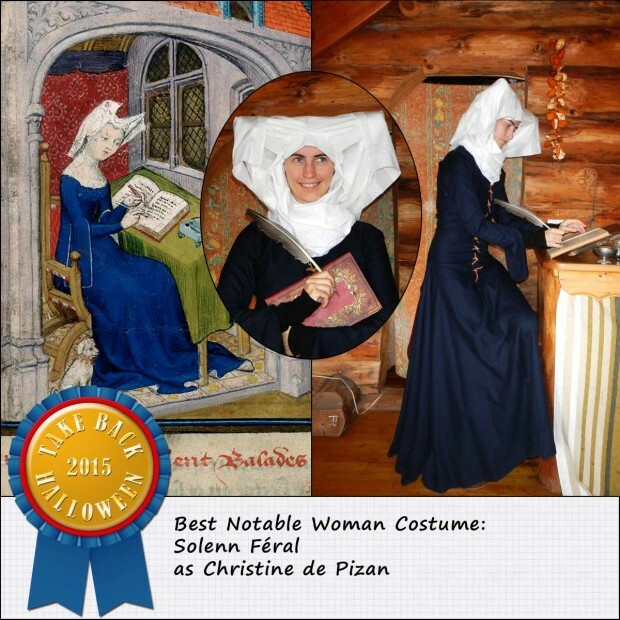 Bonus points for the awesome photo shoot; the only thing missing is Christine’s little dog (you can get a better view on our Christine de Pizan page). Winner: Anneliese Meck as the young Queen Victoria. This exquisite costume began life as a discarded 80s prom dress, which Anneliese transformed into queenly attire in a matter of hours the weekend before Halloween. It will perhaps not surprise you to learn that Anneliese is an aspiring costume designer; her talent, skill, and eye for balance and detail are superb. 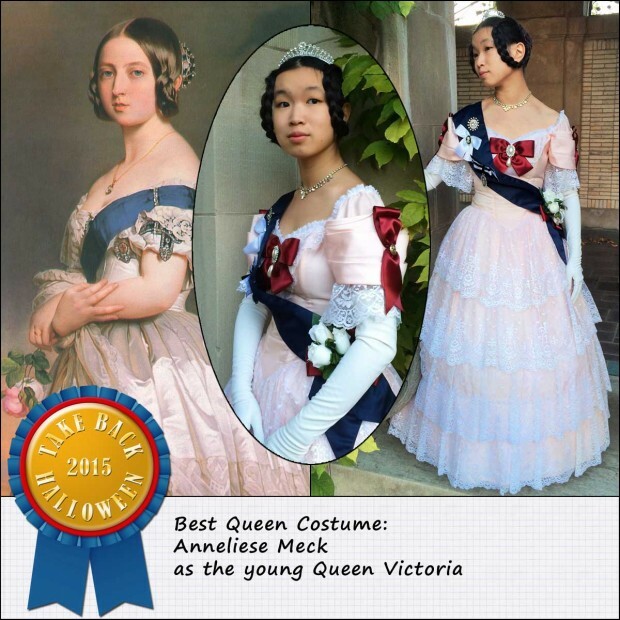 You can read more about this costume on her blog: A Young Queen Victoria. Winner: Becky Murphy as Freyja. 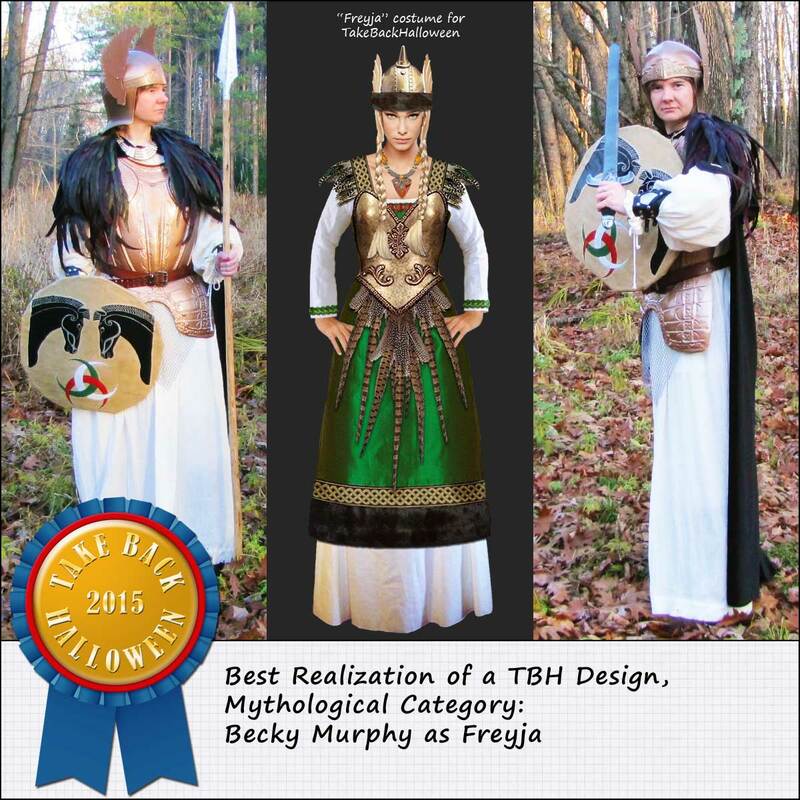 Becky was inspired by our Freyja design, but took things in her own direction to make the costume even more of a battle goddess look. The chainmail is a toy hammock that she spray-painted silver and hammered metallic black; the shield was made from styrofoam and plaster cloth. The cloak is black velvet with a huge feather collar attached. At the last minute Becky decided the green apron dress/overskirt from the original design wasn’t working, but the costume still looks great without it. 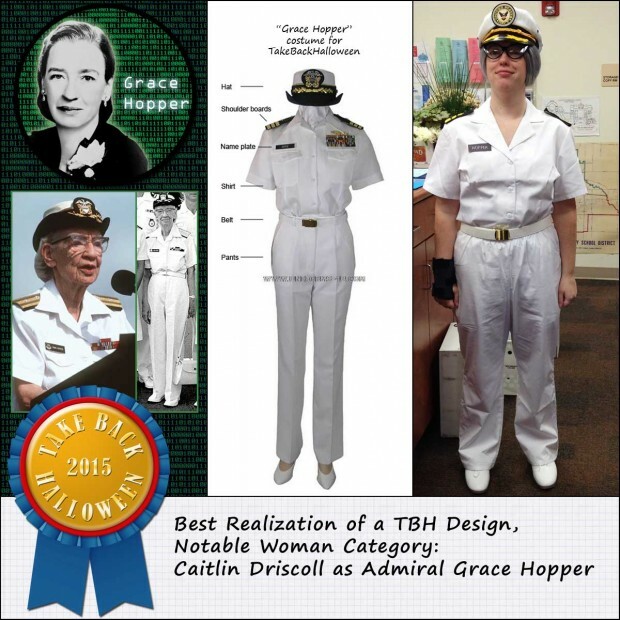 Winner: Caitlin Driscoll as Admiral Grace Hopper. Caitlin is a Technology Resource Teacher at Parkway Elementary School in Alliance, Ohio, and this year for Halloween she used our guide to dress up as Grace Hopper. She writes, “I also issued a video challenge to the school that played after daily morning announcements. Students and teachers learned about Grace Hopper, what she did (they liked the story with the moth), and why she is important to the history of technology.” Way to go, Caitlin—and thank you for being such a great teacher! Winner (tie): Angel Rios as Catherine the Great. 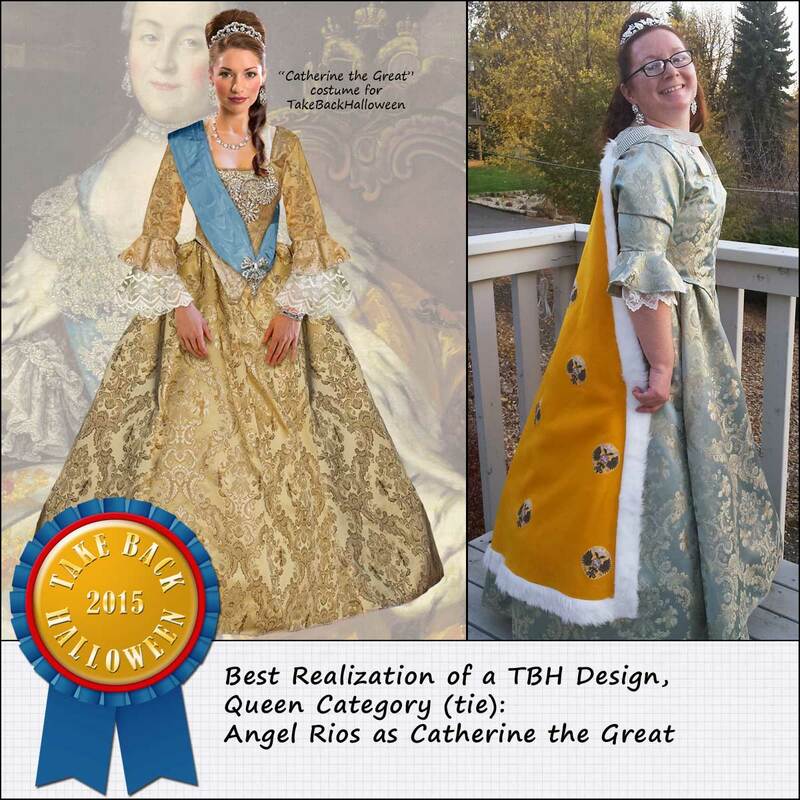 We just love what Angel did with our Catherine the Great costume design. The dress is the exact same one we recommend, but Angel has really bumped things up a level with the addition of a cape. She put it together using gold fleece, faux fur trim, iron-on coat-of-arms decals, and bling on a roll to recreate the diamond chains that held Catherine’s cape around her shoulders. Wonderful! 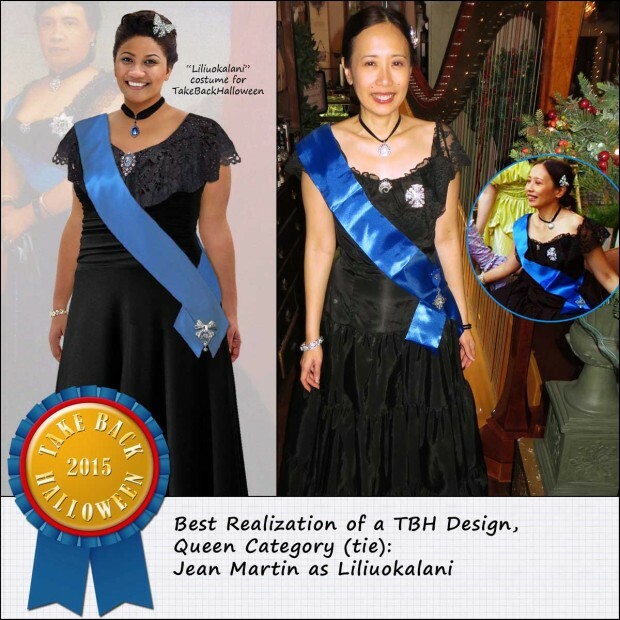 Winner (tie): Jean Martin as Liliuokalani. Jean did a beautiful job with our Liliuokalani design, right down to the butterfly in her hair. The black dress, lace trim, the order sash, the choker—it’s all perfect. Thank you, Jean, for presenting such a lovely image of a great queen. 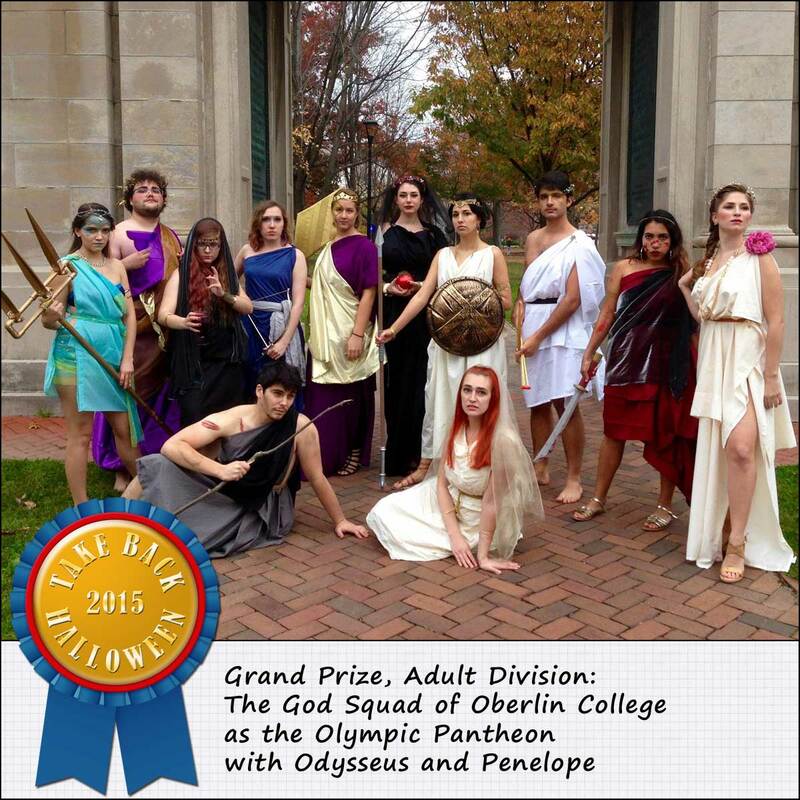 Winners: The God Squad of Oberlin College as the Olympic Pantheon (plus Odysseus and Penelope). To get the full effect, you need to check out the God Squad of Oberlin College photo album on our Facebook page. The story is that ten friends at Oberlin College decided to dress as the Greek pantheon, inspired by or using our costume designs, while another two friends joined the party as Penelope and Odysseus. The resulting group calls itself the God Squad of Oberlin College, which we note would also be a really good band name. Roll credits: Katerina Walter as Poseidon, Michael Ponz as Dionysus, Caitie Rodger as Hecate, Amelia Wedel as Artemis, Sarah Larkworthy as Zeus, Emma Sterling as Persephone, Margaret Saunders as Athena, Felipe Firmo as Apollo, Casey Emerson as Ares, Morgan Griffith as Aphrodite, Perry Hatchfield as Odysseus, and Stephanie Zellers as Penelope. As with the Adult Division, these are the prize categories that were announced before the contest. They’re based on our own costume categories here on the website, except no glamour grrls because reasons. 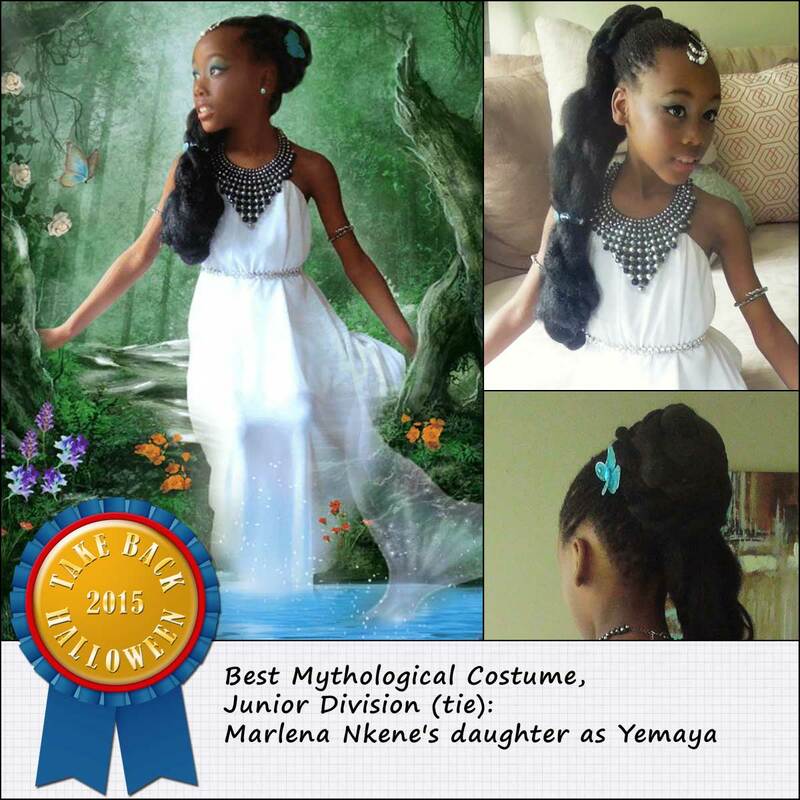 Winner (tie): Marlena Nkene’s daughter as Yemaya. This elegant little outfit is perfect for Yemaya, whose colors are pure white, shining silver, and the watery blue of the ocean. Marlena’s daughter looks wonderful—notice the glittery belt and silver jewelry—and even her makeup is gorgeous. We love it. 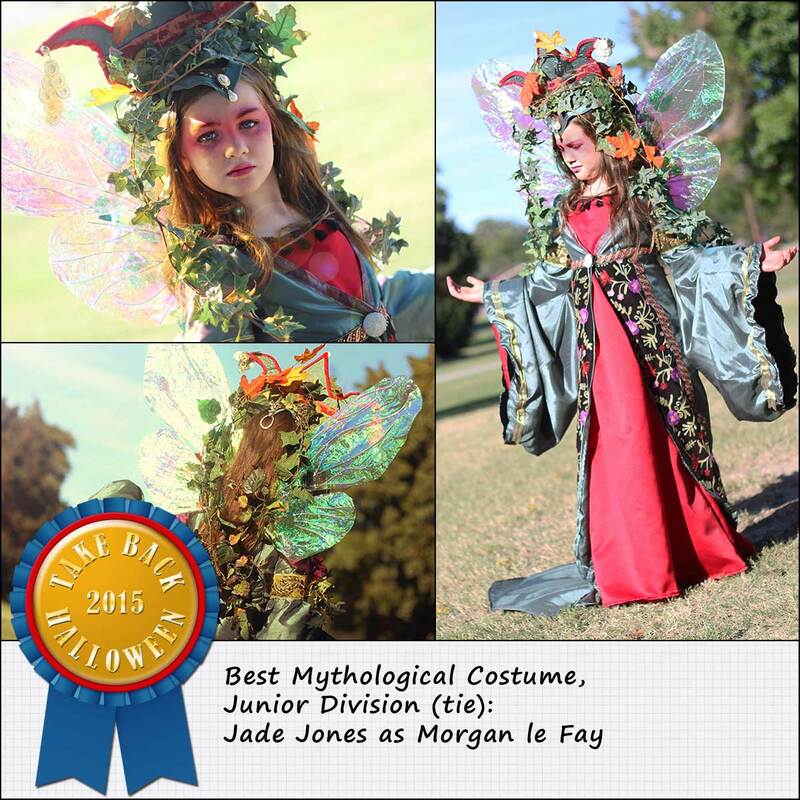 Winner (tie): Jade Jones as Morgan le Fay. Emphasis on the “fay,” because obviously this Morgan has gone pretty far into fairy territory—she’s even sprouted wings! This imaginative and exuberant costume was designed and made by Jade’s aunt, Heathery Hebert (aka Heathery Mythos). Beautiful work. 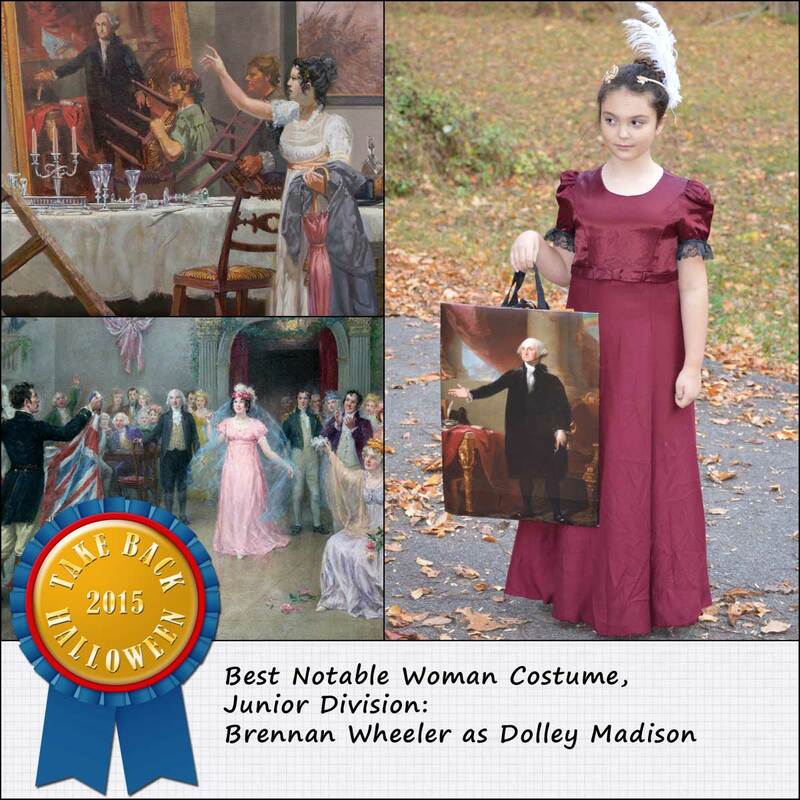 Winner: Brennan Wheeler as Dolley Madison. Brennan is only 7 years old, but she was the one who came up with the solution to make sure everybody knew she was Dolley Madison: she would attach Washington’s portrait (the one Dolley is famous for saving) to her trick-or-treat bag. What a smart little girl! And kudos to Brennan’s mom for pulling together the costume and making it happen. 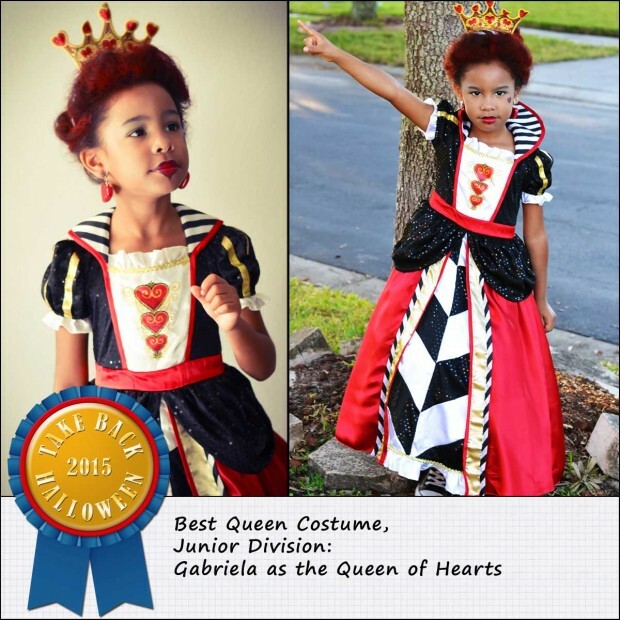 Winner: Gabriela as the Queen of Hearts. “Off with your heads!” Gabriela’s mom tells us she had a ball playing the Queen of Hearts, and she’s certainly the cutest version we’ve ever seen. Notice all the little touches, including the heart-shaped earrings and makeup. So precious! Winner: Faith Harrison as Ada Lovelace. 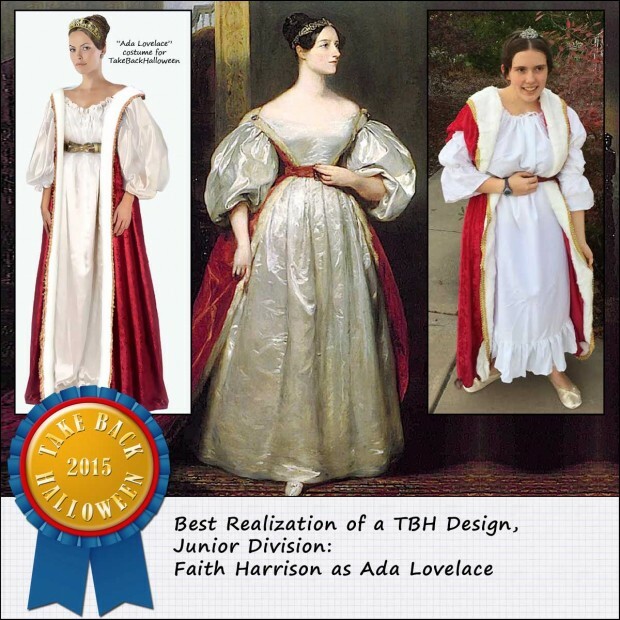 Faith put together this costume herself using our Ada Lovelace page. Doesn’t she look perfect? She even has the ballet slippers and the little tiara. Wonderful job, Faith! 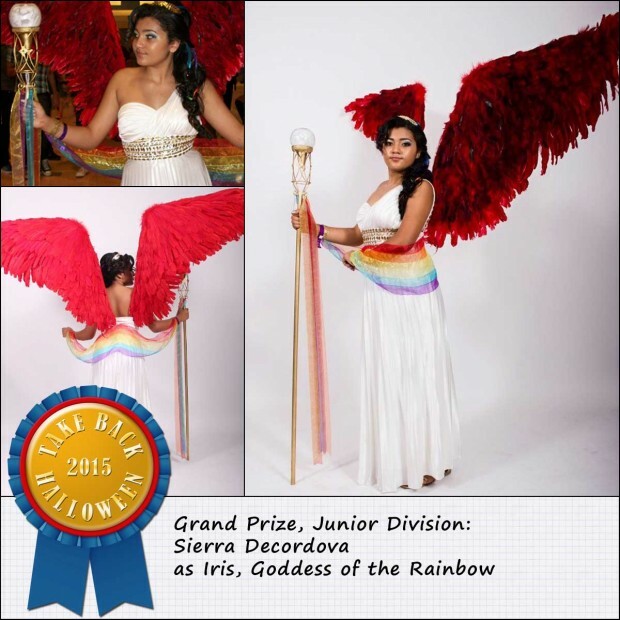 Winner: Sierra Decordova as Iris, Goddess of the Rainbow. The wings are made from 1200 duck and rooster feathers. The dress is handmade and bedazzled. The staff is a tiki torch strung with LED lighting, and the ribbon represents the rainbow. Ladies and gentleman, Sierra Decordova: 14 years old and already an incredibly accomplished costumer with boatloads of talent and ingenuity. Congratulations, Sierra! This division is for calling out particular accomplishments, like superior artistry or homemade craft-fu or an inspired performance/impersonation. All winners will receive a $25 Amazon gift certificate. 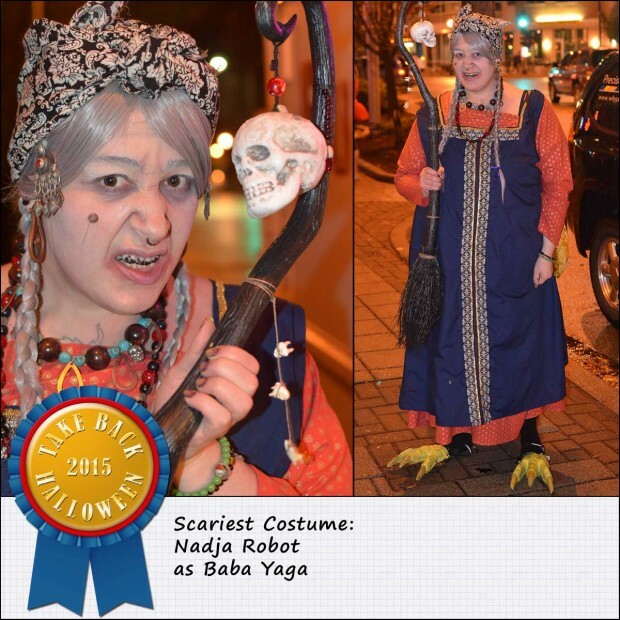 Winner: Nadja Robot as Baba Yaga. Nadja did a lot of research to make her version of Baba Yaga as authentic as possible, and constructed the dress and sarafan herself. She also made the jewelry (skulls), the chicken feet (from toy velociraptor claws), and used tooth black to make her teeth look dirty. Ew! And check out the wart with the one giant hair sprouting from it. Winner: Eleanor Dulcinea Galvez as Justice Ruth Bader Ginsburg (Notorious RBG). 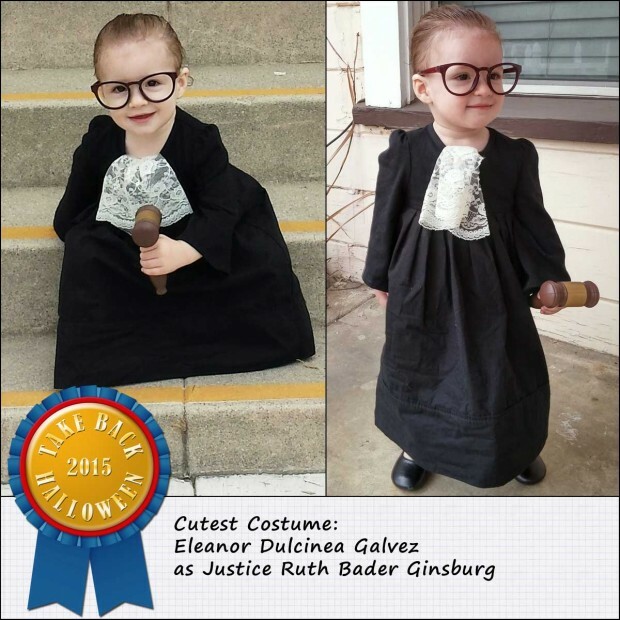 This pint-sized Notorious RBG is squee-level cute. And talk about resourceful: Eleanor’s mom made the costume from a t-shirt and a pillowcase. A pillowcase! Winner: Mabel Kelly as Amelia Earhart, with Mom and Dad as clouds. Is this some kind of crazy genius or what? 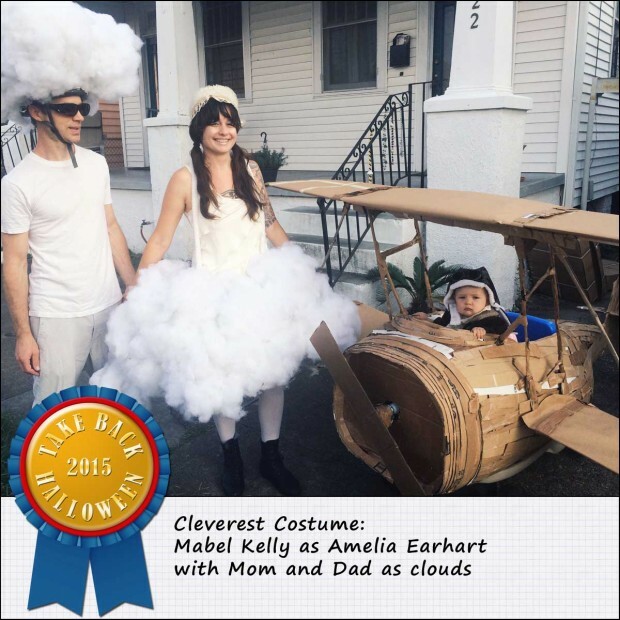 Mabel’s mom and dad built the plane on a little wagon, dressed themselves as clouds, and then accompanied (pulled) Mabel as she “flew” through the neighborhood on Halloween. Too cool for words. Winner: Maia Weinstock as Justice Ruth Bader Ginsburg (Notorious RBG). This is so good it’s almost uncanny. 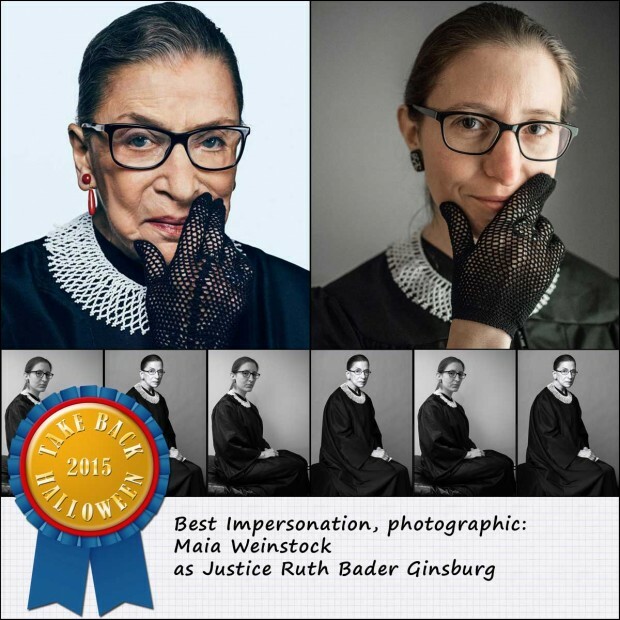 The photo shoot is by Jordi and Maia Weinstock; for legal reasons (heh) we should probably say that the original photo of Justice Ginsburg wearing gloves is by Sebastian Kim, and the photo of her seated with her hands in her lap is by Ruven Afanador. 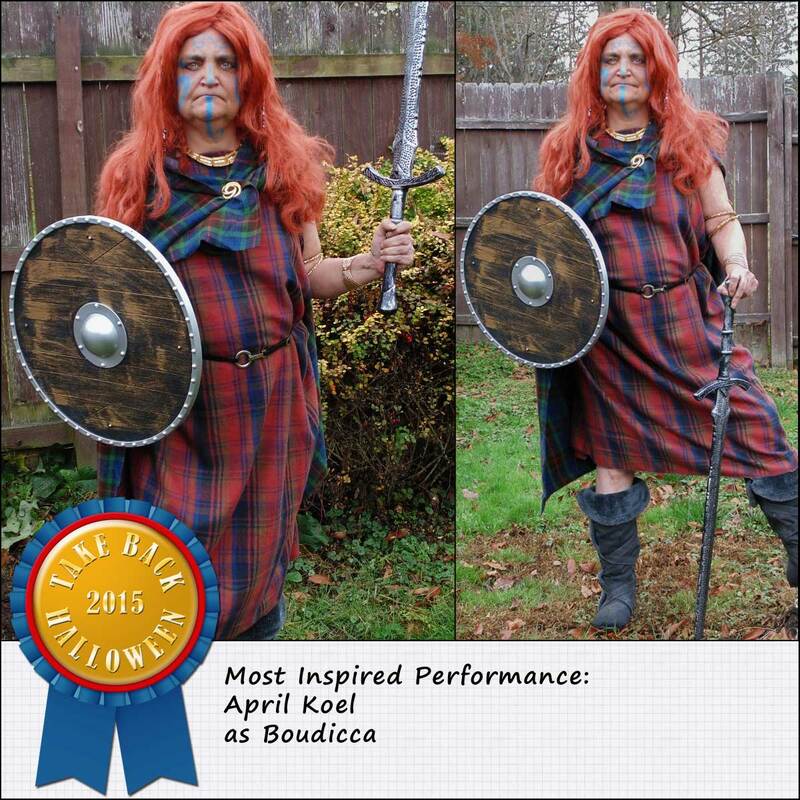 Winner: April Koel as Boudicca. 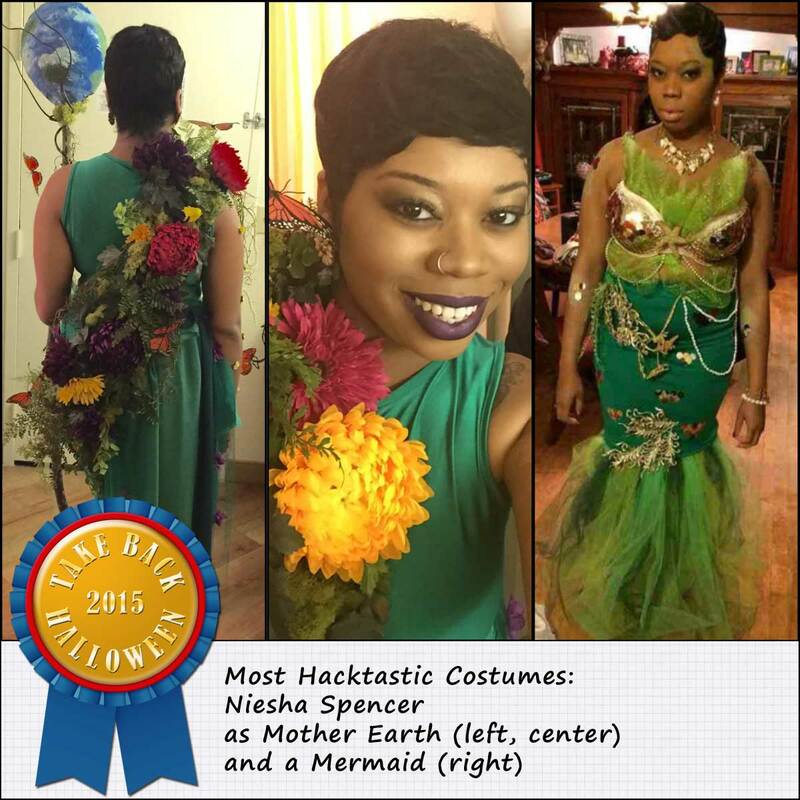 Winner: Niesha Spencer as Mother Earth and as a Mermaid. Winner (three-way tie): Ainsley H. as Puabi. When we started this website five years ago, some people were skeptical of our decision to include costumes like the one for Puabi. “Who wants to dress up as an ancient Sumerian?” they said. Well, we do—and, it turns out, so do some other people as well. 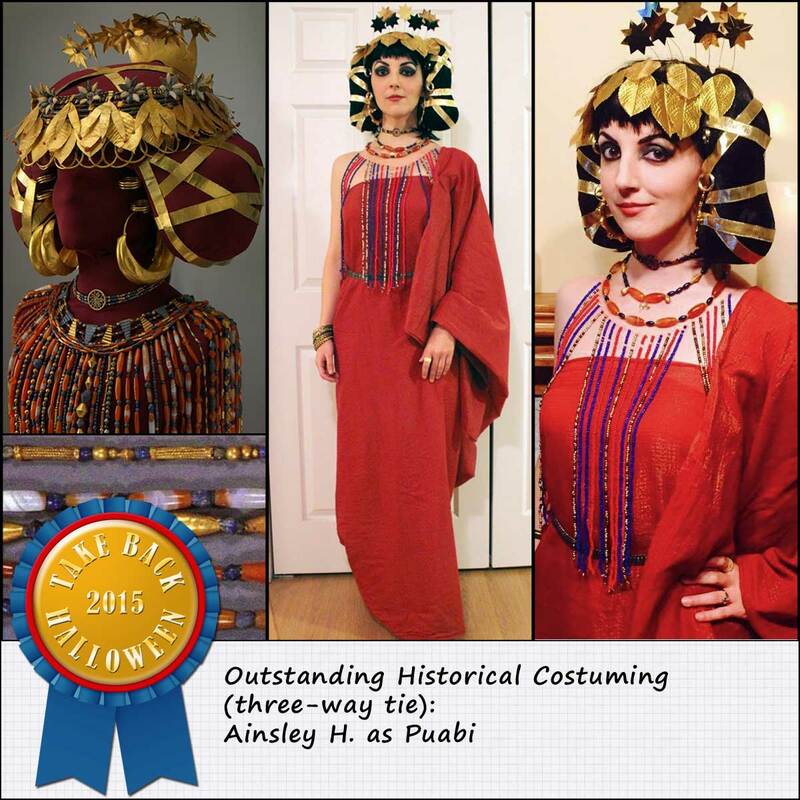 Last year Janice Strickland entered a beautiful Puabi costume in our contest, and this year we have two incredible Puabis. First up is this superb creation from Ainsley, who also happens to be an Assyriologist. She did an excellent job of replicating the actual artifacts from Puabi’s tomb, including that jaw-dropping beaded cape. Winner (three-way tie): Laura Gill as Puabi. 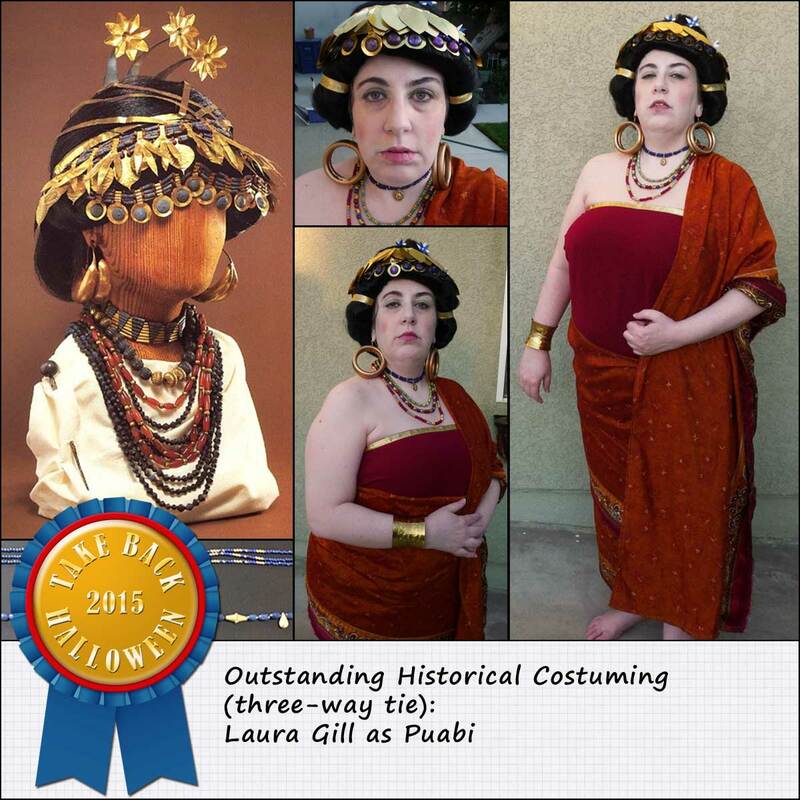 Our second Puabi is from Laura Gill, who modeled her headdress after a different reconstruction of the jewelry in Puabi’s tomb. She cut out and perforated all the leaves and medallions from sheet brass and sewed them onto a gold ribbon. The “lapis lazuli” stones on the medallions are actually blue vase gems that were hot-glued on. And the huge earrings are shower curtain rings spray painted gold! 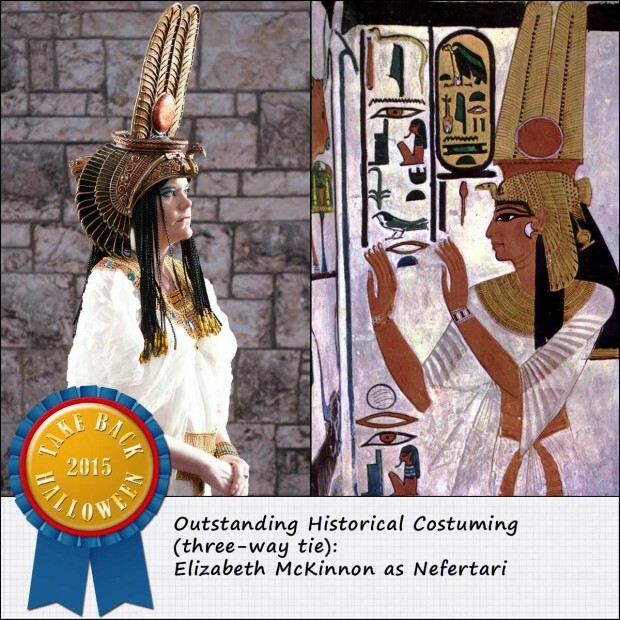 Winner (three-way tie): Elizabeth McKinnon as Nefertari. Elizabeth is a history student, and her goal here was to recreate Nefertari’s crown and dress as accurately as possible based on the paintings in her tomb. Boy, did she ever! That phenomenal crown was a commission made by Elizabeth’s friends at Organic Armor, while the dress was completely hand-sewn and hand-pleated. Winner: Monica De Souza-Griffith as the TARDIS. Modern fictional characters aren’t eligible for our regular category awards, but we’ve noticed that there is a significant overlap between people who like Take Back Halloween and people who like Dr. Who. 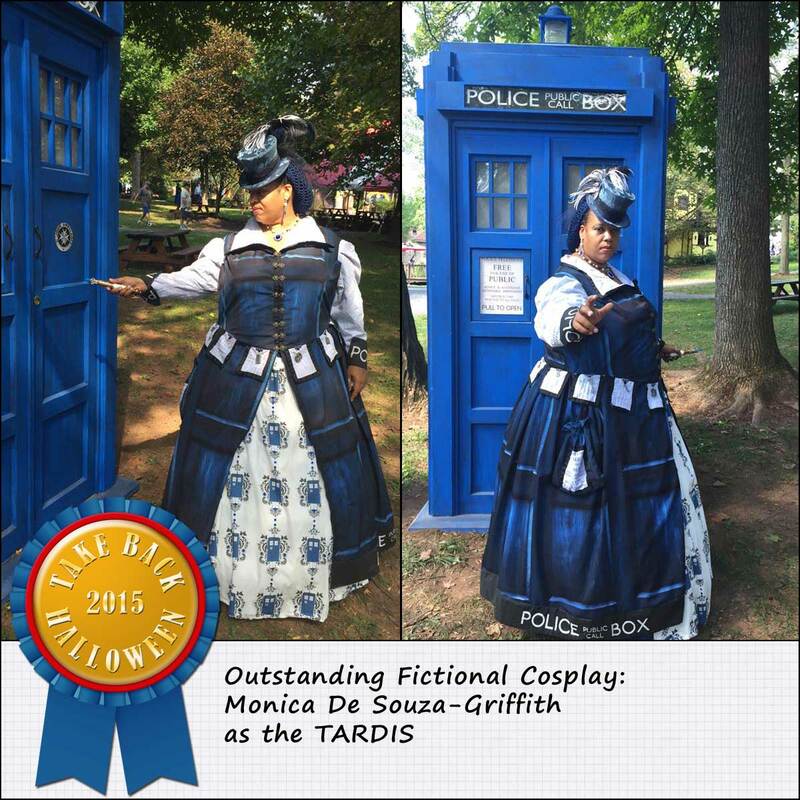 We receive a number of Dr. Who-related contest entries every year, but Monica’s TARDIS dress blows everything out of the water. Gorgeous and perfect. 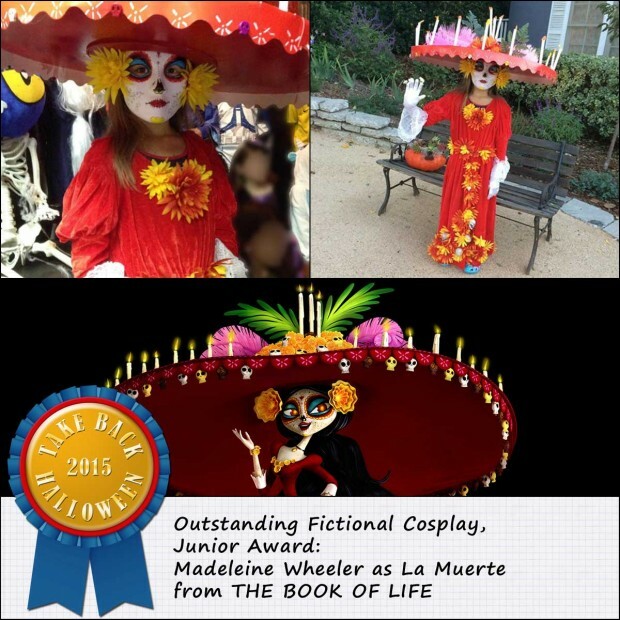 Winner: Madeleine Wheeler as La Muerte from The Book of Life. Ditto what we said above about modern fiction, but La Muerte is at least based on myth and folklore: she’s a blend of Mictecacihuatl, Santa Muerte, and La Catrina. Madeleine’s mom constructed the amazing sombrero from a foam hat, foamcore board, straws, and gallons of hot glue. The facepaint isn’t really facepaint; it’s a mask painted to look like La Muerte. We are in awe. Congratulations to all. These creations are fantastic!!! These are outstanding examples of creative ingenuity and a whole lot of fun. Thank you one and all who take the time to make these elaborate costumes and to those who give them a reason.